Tired of traditional baked potatoes? Try these red potatoes flavored with traditional Italian herbs, sun-dried tomatoes, and Parmesan cheese. The recipe goes together in a snap, then the potatoes are roasted in the oven. Scrub the potatoes, removing any bad spots. Cut in half through the center (not end to end). Place cut potatoes in a plastic bag with the olive oil. Seal and toss to completely coat the potatoes. Arrange the potatoes, cut-side up, in a ceramic 2-1/2- to 3-quart Dutch oven. 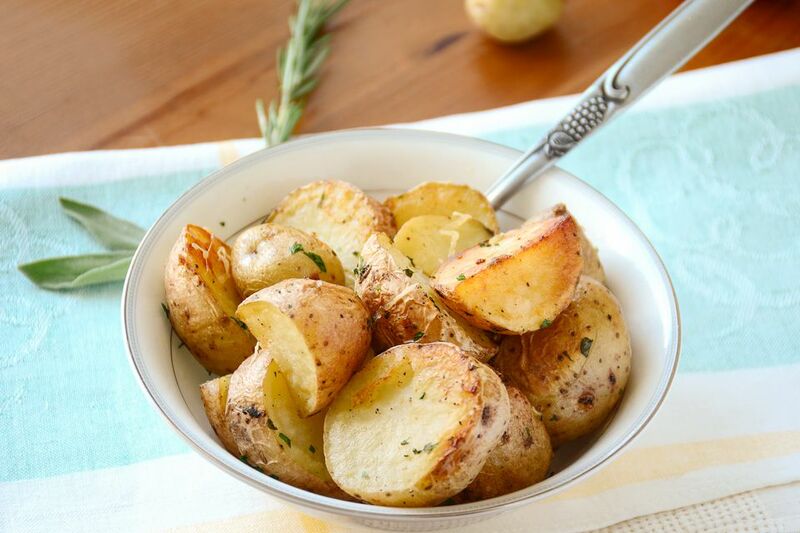 Sprinkle potatoes with oregano, basil, onion powder, garlic powder, sun-dried tomatoes, salt, and pepper. Top with Parmesan cheese and a light dusting of paprika. Cover with the lid and bake for 30 minutes. Remove lid and continuing baking for another 30 minutes or until potatoes are easily pierced with a toothpick. Garnish with minced fresh parsley, if desired.